I just received an e-mail from a new convert who was concerned because some of her new Catholic friends have told her that she should go to the Tridentine Mass or her children will never grow up to love the Church and the liturgy. They said the Novus Ordo Mass (which we celebrate in the vast majority of Catholic churches) is detrimental and inadequate. I told the woman that she could trust the Church. There are always those that look back to the mythical "glory days" of the past. Even the first century, during the life of the Apostles were no "glory days" — just read the letters to the Corinthians to see that! Here is what I wrote her in brief: "Watch the radical Traditionalists — two things characterizes most of them. First, they are angry and bitter and have lost their joy; and second, it is all they can talk about. They have forgotten how to smile, how to talk about evangelism, the Scriptures, the family, the joyful things they should be discovering in their daily walk with Jesus, etc. "They seem to have become trapped in a dark corner of complaining and griping about about liturgy and the hierarchy. Many have a tendency to drift further — even to the point of rejecting Vatican II and our current pope. 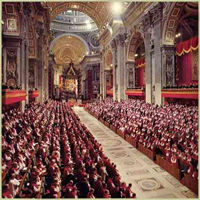 In fact, for them, there has been no pope since Vatican II. They try to recruit others to join them in their gloom and cynicism. "I tend to avoid them. I have learned that I can trust Jesus in his Church. In fact, I learned early on — whenever you join a new organization or society — look for the far right and the far left and stay as far away from both of them as you can. Watch for the new converts who jump on the horse — only to fall off the other side."